I’ve just found Wednesday’s gratitude post in drafts so here it is, late but none the less relevant for that. Autumn is making it’s mark in my garden but there’s still plenty of colour: roses are blooming, naked ladies (Belladonna Amaryllis), are flowering and self-sown cornflowers are flourishing. Today I’m grateful for evidence than the earth is still laughing in my garden. You cannot do a kindness too soon, for you never know how soon it will be too late. 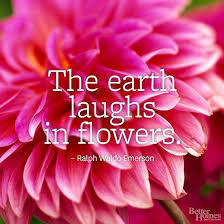 Ralph Waldo Emerson who was born on this day in 1803.